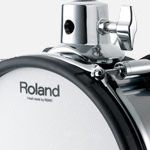 As a Roland Authorised Dealer, we keep full stock of all TD/V-Drum Kits and offer lifte time pre and post-sale support. SUPERNATURAL samples and superior quality! AC-TD25KV Roland TD-25KV FREE Artist Collection drum patches when TD25 is purchased from AC Hamilton call 01772 722468 Serious drummers can tap into high-end V-Drums playability in a mid-level kit for home and studio that is found in the TD-25KV. 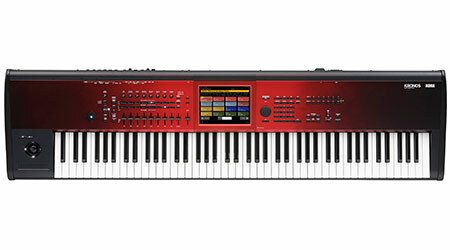 The Roland TD-25KV comes equipped with a sound engine that is derived from the flagship TD-30. 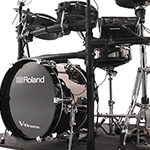 The Roland TD-25KV delivers all the acclaimed expressiveness that makes Rolands top-line V-Drums the undisputed choice of pro players everywhere. 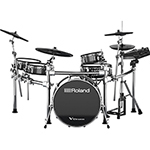 Speak to our Drum specialist today for more information and the best price on the Roland TD25KV. AC-SPD1K The Roland SPD::ONE KICK is a new type of digital percussion pad, one that allows any musician to add genuine kick drum and percussion sounds to their performances. It contains 22 realistic percussion sounds, including kick drums, stomp box, shakers, cowbells, and more, and you can even import your own original audio data into one of the 12 internal sound banks. AC-SPD1P The Roland SPD::ONE PERCUSSION is a new type of digital percussion pad, one that allows any musician to add authentic percussion sounds to their performances. It contains 22 realistic percussion sounds, including snare and kick drums, hi-hats, cymbals, shakers, tambourines, and more, and you can even import your own original audio data into one of the 12 internal sound banks. 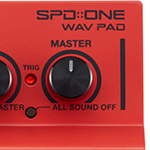 AC-SPD1W The Roland SPD::ONE WAV PAD is a new type of digital percussion pad, one that allows any musician to perform with their own sounds and samples. Just simply connect the pad to your PC or MAC and drag your files onto the drive that appears. 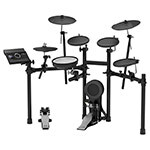 AC-TD50KVRF Re boxed Bargain Roland TD-50KV V-Drum Kit with Dynamic Prismatic Sound Modelling, Enhanced Playability, High-Resolution Sound and Brand New Digital Snare and Ride Cymbal pads. 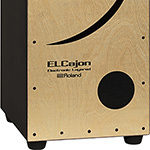 AC-EC-10M The EC-10M ELCajon Mic Processor is a totally unique and innovative creative tool designed for the acoustic cajon. 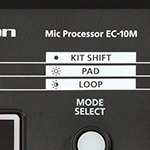 Compact and battery powered, the EC-10M picks up the cajons acoustic sound with the included clip-on condenser mic, which is also used to trigger a variety of onboard tones for layering with the acoustic voice. 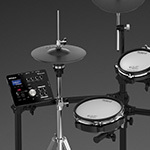 AC-TD50KV The Roland TD-50KV is the latest flagship model from the V-Drums range. The TD-50 presents all-new Prismatic Sound Modelling which takes feel and realism to a whole new level. Mix this with the new digital Snare and Ride Cymbal, and you have the latest technology that looks, feels and sounds as natural as an Acoustic. Come and see this kit in store and discover it for yourself! 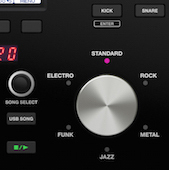 AC-SPD30 The Roland Octapad SPD-30 gives a new edge to a legendary product. 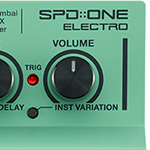 The SPD-30 is tough, road ready and houses the latest electronic percussion sounds for the most demanding performers. This phenomenal TD-4KP drum kit from Roland takes drum portability and versatility to a whole new level. With a compact and sleek design, the Roland TD-4KP has been developed to pack down into a carrying case for easy, quick transport. The TD-4 module is a minimal design for ease of use. Very quick to set-up with limited, yet very effective editing functions. Perfect for drummers who are always on-the-go! Speak to our Drum specialist today for more information, and the best prices. 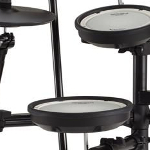 AC-TD1K The Roland TD-1K is a compact, stylish and affordably priced addition to Rolands V-Drums electronic drum kit range, offering better sounds, playability and functionality than ever before! With all the coach functions present to help develop and further your playing skills, the Roland TD-1K is by far the best option for beginner drummers. Speak to our Drum specialist today for more information, and the best prices. AC-SPD-SX The new SPD-SX Sampling Pad puts powerful sample creation and playback under your sticks with innovative audio-capturing features, expressive playability, three multi-effects engines, and much more. 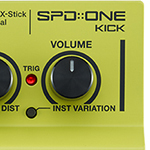 The SPD-SX replaces the previous SPD-S model, but reuses a very similar layout which fastly became popular with session musicians from a number of backgrounds. 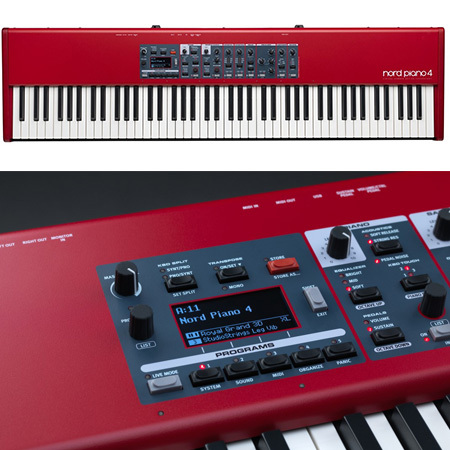 The Roland SPD-SX is much easier to use than its predecessor, making use of a computer application to manage and assign samples; and to also create new patches. A truly great piece of kit! Speak to our Drum specialist today for more information, and the best prices. AC-SPD30BK In a stunning black finish the Roland Octapad The Roland Octapad SPD-30 gives a new edge to a legendary product. 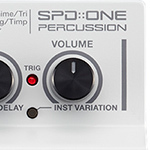 The SPD-30 is tough, road ready and houses the latest electronic percussion sounds for the most demanding performers. This phenomenal TD-4KP drum kit from Roland takes drum portability and versatility to a whole new level. With a compact and sleek design, the Roland TD-4KP has been developed to pack down into a carrying case for easy, quick transport. The TD-4 module is a minimal design for ease of use. Very quick to set-up with limited, yet very effective editing functions. Perfect for drummers who are always on-the-go! 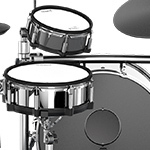 Speak to our Drum specialist today for more information, and the best prices. 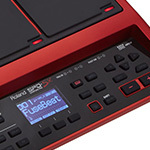 AC-SPD1E The Roland SPD::ONE ELECTRO is a new type of digital percussion pad, one that allows any musician to add electronic sounds to their performances. It contains 22 iconic sounds, including fat snares, crisp hand claps, electronic cowbells, and more, and you can even import your own original audio data into one of the 12 internal sound banks. AC-TD4KP This phenomenal TD-4KP drum kit from Roland takes drum portability and versatility to a whole new level. With a compact and sleek design, the Roland TD-4KP has been developed to pack down into a carrying case for easy, quick transport. The TD-4 module is a minimal design for ease of use. Very quick to set-up with limited, yet very effective editing functions. Perfect for drummers who are always on-the-go! 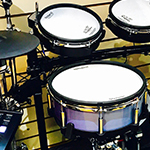 Speak to our Drum specialist today for more information, and the best prices. AC-TD50KRF Presenting The All-New Flagship Roland TD-50K V-Drum Kit with Dynamic Prismatic Sound Modelling, Enhanced Playability, High-Resolution Sound and Brand New Digital Snare and Ride Cymbal pads. AC-SPDSXSE Rolands SPD-SX Sampling Pad is the professional touring standard for triggering custom samples, loops, and even complete backing tracks. 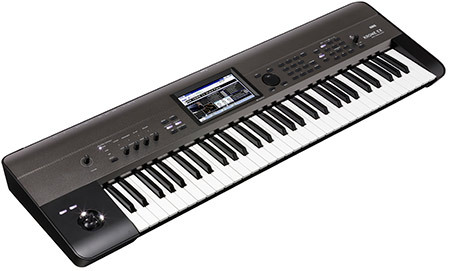 It also supports real-time sample capture with its exclusive Multi-Pad Sampling function. The SPD-SX Special Edition is identical in functionality to the original SPD-SX, but features greatly expanded onboard storage. With 16 GB of internal memory available, its now possible to load enough studio-quality WAV samples to last an entire gig and beyond. 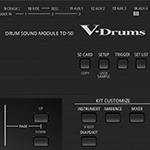 AC-TD50KVX The Roland TD-50KVX is the latest flagship model from the V-Drums range. The TD-50 presents all-new Prismatic Sound Modelling which takes feel and realism to a whole new level. Mix this with the new digital Snare and Ride Cymbal, and you have the latest technology that looks, feels and sounds as natural as an Acoustic. In addition to this the TD-50 KVX also comes with the brand new KD-220 bass drum which takes all the stage presence of an acoustic bass drum and makes it as manageable as an electronic bass drum. 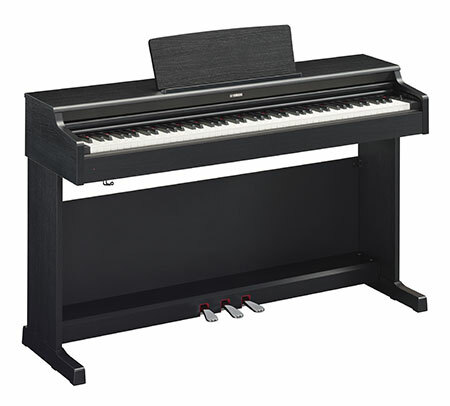 Come and see this kit in store and discover it for yourself! AC-TD17KVX The TD-17 KVX is a brand new addition to the latest line of the Roland compact Series of V-Drum Kits that they are so well known for. 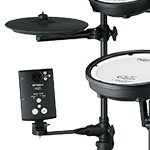 It combines all of the amazing high quality sounds that you get from the Prismatic Sound engine found in the TD-50 flagship V-Drum kit along with a small compact frame, couple that with the newly designed drum pads and you have an affordable electronic drum kit which is as close to acoustic drums as your going to get. AC-TD17KL The TD-17 K-L is a brand new addition to the latest line of the Roland compact Series of V-Drum Kits that they are so well known for. It combines all of the amazing high quality sounds that you get from the Prismatic Sound engine found in the TD-50 flagship V-Drum kit along with a small compact frame, couple that with the newly designed drum pads and you have an affordable electronic drum kit which is as close to acoustic drums as your going to get. AC-TD17KV The Roland TD-17KV drum kit offers an as close to acoustic experience as possible with all the benefits of high quality digital technology. AC-SPD-SXRF Roland SPD-SX Sampling Pad Ex-Demo. Powerful sampling creation and triggering for drummers needing that extra special from their drumming creativity. Finance available. AC-TD25 The BRAND NEW TD25 Module takes SuperNATURAL technology to the next level, replacing the TD-15 range. An improvement in all areas! AC-TD50DP As an ambitious pro drummer, you know that anything less than the ultimate sound and feel will hold you back. Introducing the new Roland TD-50 drum sound module: the flagship release in our acclaimed V-Drums range, created for top-flight live performance, intense practice sessions and eclectic studio work. AC-TD50K Presenting The All-New Flagship Roland TD-50K V-Drum Kit with Dynamic Prismatic Sound Modelling, Enhanced Playability, High-Resolution Sound and Brand New Digital Snare and Ride Cymbal pads. AC-TD-50DSM As an ambitious pro drummer, you know that anything less than the ultimate sound and feel will hold you back. Introducing the new Roland TD-50 drum sound module: the flagship release in our acclaimed V-Drums range, created for top-flight live performance, intense practice sessions and eclectic studio work. 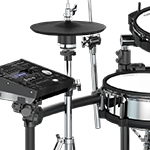 AC-TD-1KPX The Roland TD-1KPX is the latest addition to the portable V-Drums line. 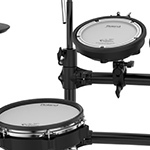 Despite not taking much floor space and offering easy portability, the TD-1KPX is supplied with a rock-solid stand that houses Rolands renowned mesh pads all round in the form of the PDX-8 and PDX-6s. 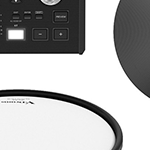 In addition to this, the TD-1KPX also offers 3 of Rolands CY-5 V-Cymbal Pads and the new FD-9 Hi-Hat Foot Controller. To finish off the TD-1KPX is the KD-1 kick pad and the TD-1 Sound Module, which offers 15 pre-set kits, Coach and Metronome functions and Songs to practice and play along to. AC-TD-4KPC This phenomenal TD-4KP drum kit from Roland takes drum portability and versatility to a whole new level. Here at A&C Hamilton Musical Instruments, we pride ourselves on selling the very best brand in the electronic drum kit world... Roland. 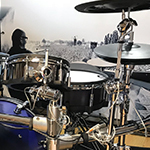 We endeavour to keep stock of every drum kit within the V-Drum range; and also have Roland Experts in-store and over the phone to offer pre and post-sale support, assuring that you are getting the very best deals and advice that is available. For more information, and any queries, please don't hesitate to contact us.